In addition to its highly skilled employees, Niagara has invested on modern equipment in order to manufacture quality fans & blowers. Fan parts are designed and drawn in AutoCad and then cut using a CNC Plasma Cutting Machine. 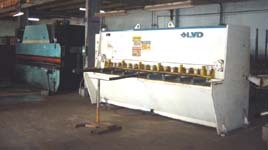 Hydraulic shears, Press brake and Rollers are use to cut, bend and roll various components. Niagara is also proud of its highly skilled Welders. All of our blower wheel are dynamically balance to ANSI standard Quality Grade G-6.3 or as per AMCA standard 204-96 (Balance Quality & Vibration Level for Fans) using our computerized Dynamic Balancing Machine. As early as 1992, Niagara has started powder coating its fan blades. Realizing the advantages and benefits of powder coating in terms of quality finish, Niagara eventually invested in a fully coveyorized Powder Coating System. Niagara’s painting facilities allow for both wet paint & powder coat finishing. All fans are cleaned prior to painting either by using a high pressure spray wash or an eight stage dipping process.